As the way we generate electricity changes, so do the associated greenhouse gas emissions. Thanks to low natural gas prices, 2016 was the first year that more electricity was generated from natural gas than from coal. At the same time, continued decreases in costs and sustained incentive policies for wind and solar power have accelerated the growth of renewable electricity. In 2016, the new combined capacity added of wind and solar was larger than the new capacity for natural gas. All of these changes directly affect how much carbon dioxide (CO2) is emitted by each megawatt-hour (MWh) of electricity generated. Deep emissions reductions are needed in the electricity sector to limit the impacts of climate change. To track the progress of reducing the emissions intensity of electricity, our interdisciplinary research team at Carnegie Mellon University’s Scott Institute for Energy Innovation launched the Power Sector Carbon Index. The index reports an accessible metric — the carbon intensity of U.S. electricity generation. We rely on publicly available data to create an easily understood, analytically transparent, and timely summary of the current trends in U.S. power sector CO2 emissions intensity and electricity generation. The Power Sector Carbon Index lets us know how far we’ve come, how we’re doing now, and how far we still have to go. Why is an index needed right now? While the Power Sector Carbon Index uses publicly available data that can be obtained by anyone, up until now we lacked a standardized way to calculate the carbon intensity of the U.S. electricity system. Furthermore, organizing those datasets, identifying missing or incorrect values, and compiling the information was cumbersome and time consuming. With the Power Sector Carbon Index, we’ve removed this barrier and mad these data accessible for all. Policy makers, industry, academia, non-governmental organizations, think tanks, and the public can rely on the index to quickly understand up-to-date trends in carbon intensity of the U.S. electric power sector, and get insight into the underlying drivers of these trends every three months. The index is calculated by dividing the direct emissions generated from all electricity generation sources in the U.S. electricity sector in a given time period by the total net electricity generation in that time period. The index is calculated for yearly, quarterly and monthly time periods, and values are given in pounds (lb) of CO2 per MWh, representing the CO2 emissions intensity of electricity in a specific time period. 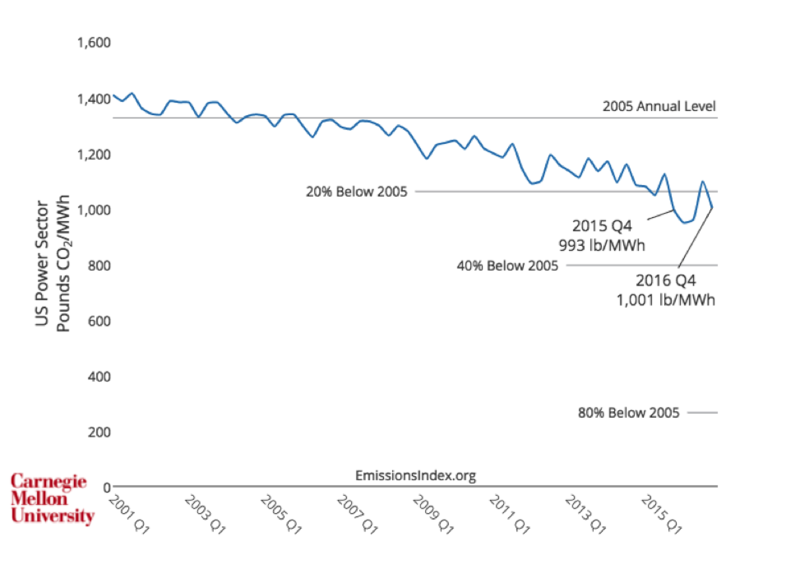 Since 2005 is often used as a benchmark year for measuring progress made in reducing emissions, the index also provides the percentage change between the current value and the annual value in 2005. For more details please see our report on “Power Sector Carbon Index: Data, Sources, and Methods” which details the sources, data, and methods for calculating the index. One of the features we always want when we visit an energy website is the ability to download the charts and the data, so our team built that capability into the Power Sector Carbon Index. We also have put our analysis code on GitHub, to enable energy analysts everywhere to build off of our work. The U.S. power sector has been getting cleaner and more efficient. CO2 emissions intensity from U.S. electricity generation decreased by 24% between 2005 and 2016 (from 1,324 lb CO2 per MWh to 1,005 lb CO2 per MWh — or 600 to 456 g CO2 per kWh). About 53% of this decrease is due to the shift in the mix of electricity generation from coal to natural gas, and an additional 4% is due to natural gas power plants becoming more efficient. About 40% of the decrease in carbon intensity is due to the increase in renewable generation since 2005. Our team provides some additional details about the drivers of change compared with 2005 in this post. The competition between coal and natural gas can also influence emissions trends from year-to-year. The Power Sector Carbon Index was 1,001 lb CO2 per MWh in Q4 of 2016, an increase of 1% when compared to Q4 of 2015. Coal returned as the electricity source contributing the largest share of electricity generation in Q4 of 2016, after natural gas held that spot in Q4 of 2015. Electricity generation from renewables and nuclear was higher in Q4 of 2016 when compared to Q4 of 2015, reducing some of the impact on the Power Sector Carbon Index from the increased electricity from coal. While the 24% decrease in emissions intensity since 2005 is a great start, there remains work to be done to achieve deep de-carbonization in the electricity system. Reducing emissions intensity by 40% relative to 2005 values would require 530 lb CO2 per MWh (360 g CO2 per kWh), and getting an 80% reduction requires 265 lb CO2 per MWh (120 g CO2 per kWh). As the power sector evolves, our team of researchers looks forward to tracking its progress and providing the data on the carbon intensity of our electricity sector.